Learn more how we can build software for your business. We specialize in the Microsoft .NET technology platform, but we love Linux too. Both technologies can be used to create elegant & functional systems. Maintainability is everything. Controlling software complexity is one of our skills. Our tooling helps get the job done. We love open source. In fact, we develop and maintain open source projects used by thousands of developers worldwide. We started from the proverbial garage; since then we've helped businesses carry out their mission by providing custom software solutions. Available in person near Los Angeles, Glendale, Burbank, Hollywood, Pasadena, and the San Fernando Valley. Available for global clients remotely. Do you need a mobile application for your business? Websites? Databases? We got you covered. 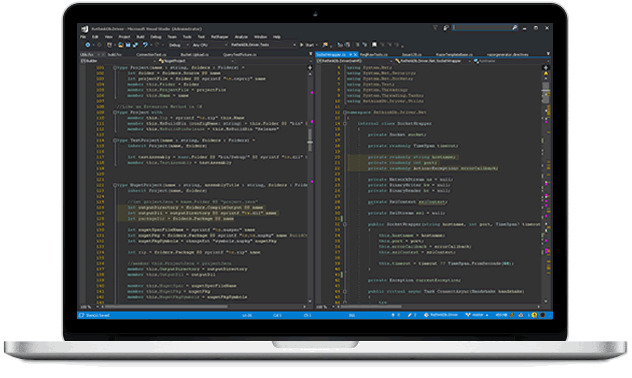 We're a full stack shop, front-end and back-end development. Is your software development team missing deadlines? Let us help. We offer training services to help your team get up to speed. Do you need to make changes to your software or website? We offer software maintenance services to keep your new & existing software working. Do you need your app or software to integrate with Google's services or Paypal? Whatever the case may be, if it has an API we can code it. We actively keep up with industry best practices and emerging technologies. 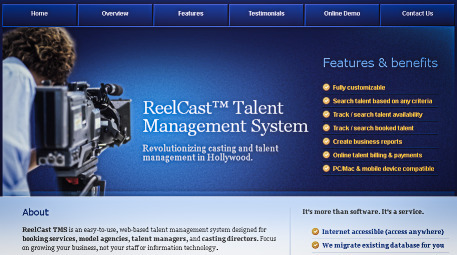 ReelCast TMS is an easy-to-use, web-based talent management system designed for model agencies, talent managers, casting directors, and booking services. You can focus on growing your business, not your staff or information technology. "Coding is more than just a job for us. We love what we do!" Co-founder and president. Brian has over 18 years of programming experience. Brian has a knack for keeping complexity of large systems under control. Brian graduated with honors from the University of California, Santa Cruz (UCSC) with a B.S. in Computer Engineering & Digital Hardware. Along with his work as an undergraduate researcher at UC Santa Cruz and UC Berkeley he has learned software development techniques and methodologies required to build secure, scalable, and fault tolerant systems. Fun fact, Brian's GitHub profile is ranked in the top 50 in the United States for the C# programming language based on GitHub project stars. Co-founder. Kritsda has over 10 years industry experience. Kritsda's has non-stop focus and drive for writing clean and maintainable code. Kritsda graduated from the University of California, Santa Barbara (UCSB) with a degree in Computer Engineering. As a co-founder of Bit Armory, he is working closely on Bit Armory's latest projects. Kritsda has many innovative ideas that help fuel Bit Armory's drive to build and develop quality software. We are generally available 7 days a week, between 10AM and 10PM, Pacific Time.